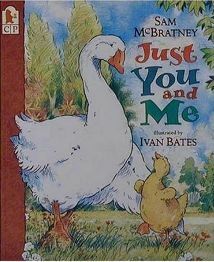 ‘Just You and me‘ is a rather delightful and endearing story about two geese and what happens to them one stormy night! It is written by Sam McBratney who is perhaps better known for having written ‘Guess How Much I Love You?’ The two main characters are Little Goosey and Big Gander Goose. Big Gander Goose is the older wiser one who looks after the slightly more nervous little one! The story takes place one evening when the two geese are going for a walk. Unfortunately as they are on their way the wind starts up, the sky darkens and it definitely looks like there is going to be a storm. What the geese need to do now is to find somewhere that is warm and dry where they can rest until the storm is over. There is just one other thing too! Little Goosey does not want anyone else to be with them – as he says to Big Gander Goose – he wants ‘Just You and Me‘. Unfortunately everywhere they find already has another small creature sheltering from the storm. Firstly they find a hole in a ditch but there is already a mouse there, who willingly offers to share his space. However, Little Goosey wants it to be just the two of them when the thunder comes, so Big Gander Goose makes an excuse that it is probably too damp in there and they go on their way! The problem with this though is that the mouse then thinks that the hole is too damp and he had better find somewhere else so he sets off after the geese! The same thing happens again when they find a squirrel sheltering in a tree and a rabbit in a cave among the rocks. They make their excuses and carry on their way looking for the perfect place – little do they know that they are now being followed by the others! Eventually the two geese find their shelter in a hole behind a bush at the bottom of the hill. They settle down until the storm has passed with Little Goosey quite happy because it’s ‘just you and me!’ It is only when the storm is over that they discover they have been sharing their shelter with all the other creatures they met on their way! But now, Little Goosey discovers that actually it was OK sharing after all! This is really such a sweet little book and tells a lovely tale of the relationship between the two geese. It is also quite funny as you see all the other creatures deciding to up sticks and follow them – and you do have to look carefully at the pictures to see this happening! My daughters think it is very funny at the end when the two geese realise that they have not been alone after all! They also love the beautiful pictures and enjoy spotting the little creatures following on behind! As it is quite a simple story, when my daughter was not quite four, she was able to retell it in her own words, and I don’t know why this book captured her imagination so much but she really loved acting it out with her younger sister! They wandered around the garden pretending that they had found the tree or the hole that they were going to shelter in, and it was quite lovely to hear them talk to all the imaginary creatures on their way! Overall, both my daughters and I really enjoy this book and would really recommend it as a fun, cute story! No Comments on "Just You and Me"